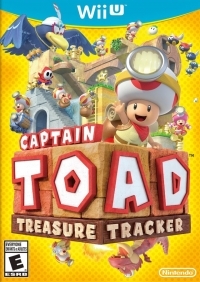 Box Text: A TRICKY TREASURE HUNT STARRING... CAPTAIN TOAD! More than 70 worlds of adventure await, each a puzzle only you can solve. Maneuver through maze-like mini-universes by twisting, turning, and touching the Wii U GamePad controller. Check out every angle for hidden gold and gems! Captain Toad can't jump, but he CAN trounce enemies and switch up the course terrain-in his own unique way, of course. 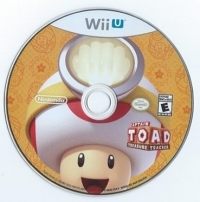 12-27-2014 pacpix Box Text A TRICKY TREASURE HUNT STARRING... CAPTAIN TOAD! More than 70 worlds of adventure await, each a puzzle only you can solve. Maneuver through maze-like mini-universes by twisting, turning, and touching the Wii U GamePad controller. Check out every angle for hidden gold and gems! The Captain's Moves Captain Toad can't jump, but he CAN trounce enemies and switch up the course terrain-in his own unique way, of course. This is a list of VGCollect users who have Captain Toad: Treasure Tracker in their Collection. 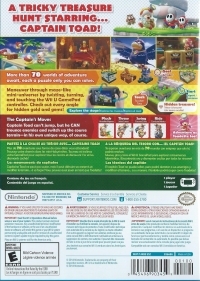 This is a list of VGCollect users who have Captain Toad: Treasure Tracker in their Sell List. This is a list of VGCollect users who have Captain Toad: Treasure Tracker in their Wish List.